It's now been one week since the NFL free agent market opened, so what better time to reflect upon who's done the most effective shopping? New England Patriots: When was the last time a defending champion added so many substantial upgrades? The trade for WR Brandin Cooks should provide an element of explosiveness and deep speed on offense that QB Tom Brady hasn't enjoyed since Randy Moss left. The acquisition of TE Dwayne Allen offsets the loss of Martellus Bennett — and at a reasonable price over the next three years. The Pats paid handsomely for Stephon Gilmore (5 years, $65 million), but they gained a top-echelon cornerback, weakened a division rival (Buffalo Bills) and now have flexibility regarding Malcolm Butler's future. 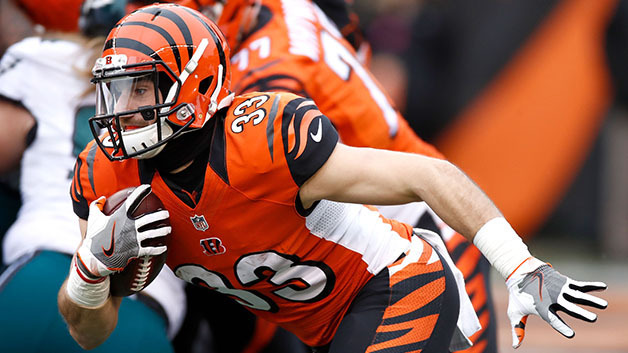 Newly signed RB Rex Burkhead could be the latest player to enjoy a breakout campaign once featured in New England's system ... unless he's outshined by former Carolina Panthers DE Kony Ealy. And the cherry on top came Wednesday when defensive leader Dont'a Hightower decided to re-sign for four years after shopping himself around the league. Hard to reach any other conclusion than Bill Belichick and Co. following up their Super Bowl LI victory with a crown as the league's offseason champs. Eric Berry: Less than two years after slaying cancer, the Kansas City Chiefs all-pro became the highest-paid safety in NFL history by signing a six-year, $78 million megadeal. Nice to see two happy endings. Offensive tackles: Russell Okung (Los Angeles Chargers), Riley Reiff (Minnesota Vikings), Andrew Whitworth (Los Angeles Rams), Matt Kalil (Panthers), Ricky Wagner (Detroit Lions) and Kelvin Beachum (New York Jets) have combined for all of five Pro Bowl nods — three belonging to Whitworth — yet all are now among the league's top 20 in terms of compensation at their position. Timing is everything, and it was a good year to be a free agent tackle given the dearth of talent available in the draft pipeline. Fullbacks: Who would have guessed that guys who play what was once thought to be an endangered position were in higher demand than Adrian Peterson? The San Francisco 49ers sent Kyle Juszczyk to the top of the positional scale with a four-year, $21 million offer. Elsewhere, Patrick DiMarco (Bills) and James Develin (Patriots) also landed multi-year, multi-million dollar deals. Tom Coughlin: The New York Giants weren't big spenders during his 12-year tenure (though GM Jerry Reese opened the vault after Coughlin left a year ago). But Coughlin, the Jacksonville Jaguars' new executive VP of football ops, didn't waste any time — or the dough now at his disposal — continuing the facelift for a franchise he helped found two decades ago. CB A.J. Bouye, DL Calais Campbell and S Barry Church all appear like first-rate recruits who could vault a good defense to the next level and quickly help Coughlin restore this team to contention in a wide-open AFC South. Aaron Rodgers: Green Bay Packers GM Ted Thompson did something he rarely does — open the checkbook for outside free agents — and upgraded the team's tight end position by adding veterans Bennett and Lance Kendricks, much to Rodgers' delight if his Twitter account is an accurate gauge. Thompson also gets kudos for retaining emerging OLB Nick Perry. Pro Bowl G T.J. Lang must be replaced, but Thompson was clearly comfortable moving on from RB Eddie Lacy. Mike Glennon: The Chicago Bears' new No. 1 quarterback reeled in a three-year, $45 million deal even though he hasn't started a game since 2014 and has thrown just 11 passes over the past two seasons. Carson Wentz: The Philadelphia Eagles' signings of Alshon Jeffery and Torrey Smith gives the second-year quarterback one of the league's more diverse and potentially dangerous wideout groups a year after it is one of the most limited and least effective. Jimmy Garoppolo: Tom Brady's backup wasn't exiled to Cleveland (at least not yet). Kirk Cousins: The Redskins quarterback (for now) is set to collect nearly $24 million in 2017. Jimmy Garoppolo: He'll apparently have to wait one more year to break the bank and receive the opportunity to lead his own team. Kirk Cousins: Despite his generous salary, he's attempting to defuse reports he wants out of D.C. He also saw his top two wideouts, Pierre Garcon and DeSean Jackson, bolt for other teams and must now hope Terrelle Pryor is up to the task of being a No. 1 receiver. Drew Brees: Maybe the New Orleans Saints wind up better off if they finally manage to field a decent defense with their perennially productive offense. But the trade of Cooks represents the second time in three years (TE Jimmy Graham in 2014) that Brees was stripped of his top target during the offseason. Washington Redskins: Aside from the drama surrounding Cousins, the franchise sustained its latest black eye with the controversial firing of GM Scot McCloughan. And if dealing with the rumors and conjecture wasn't bad enough, Washington's transition from McCloughan bridged the scouting combine and start of free agency, which doesn't exactly paint a picture of stability at such a critical point of the offseason. Tailbacks: While Juszczyk is sitting pretty, Peterson, Jamaal Charles and LeGarrette Blount are still waiting to learn where they'll be playing in 2017. Hard to believe Danny Woodhead, coming off a major knee injury, would be the most coveted back this year. But supply seems to be far outstripping demand in a year where the draft looks loaded at the position. Receivers: They've fared better than the backs, but the wideouts certainly haven't reset their pay scale. Jeffery, thought to be the best available, had to settle for an incentive-laden one-year deal ($9.5 million, not including incentives). Only DeSean Jackson, now of the Tampa Bay Buccaneers, became a top-10 earner among receivers with his three-year, $33.5 million offer. Perhaps the most disappointed was Pryor, who also took a one-year contract ($6 million, not including incentives) after his market failed to develop as he'd hoped. Cleveland Browns: They're now the proud owners of two of the league's most expensive guards (Kevin Zeitler, Joel Bitonio) — not exactly a proven formula to Super Bowl glory even if it's hard to knock investment in the offensive line. They took a hard stance with Pryor, one of the league's exciting young receivers, and wound up instead with Kenny Britt, whose pedestrian eight-year resume still commanded a four-year, $32.5 million pact. Cleveland also parted with $16 million of its precious cap space to essentially buy the Texans' 2018 second rounder in exchange for absorbing the rest of QB Brock Osweiler's contract. (It's difficult to quantify the value of a Round 2 pick, but for some context it's worth noting that the Browns' second rounder in 2016, DE Emmanuel Ogbah, will make less than $7 million over four years.) If GM Sashi Brown, coach Hue Jackson and Co. convert all these draft choices into foundational players — they sewed skepticism after their 2016 haul — or find a way to use them in constructing a deal for an established quarterback, Cleveland will rejoice. But that's a big "if" right now. Tony Romo: For some reason, he remains a member of the Dallas Cowboys even as it becomes apparent that a deal for the longtime quarterback almost certainly isn't forthcoming. Houston Texans: They unloaded last year's mistake, Osweiler and his contract, but at a premium. And with Romo still twisting in the wind (and Bouye leaving for division rival Jacksonville), it can't yet be determined if the AFC South champs are moving forward or in reverse. Darrelle Revis: Wednesday, a Pittsburgh judge threw out the charges against Revis stemming from a fight last month. But even though the legal front has been resolved, it remains to be seen what a formerly elite corner can command after an abysmal 2016 season with the Jets and questions about whether he can still be an effective player.